Yesterday was my first official Driver's Ed lesson. I am very lucky that Daddy was willing to by my instructor. I think I got the hang of it. Now I need a car. I would like a pink mini Mini convertible. I will put it on my Holiday wish list. Rosy, while you drive your dad should make himself useful and help with the signal to turn left or right. Oh that would be a help. Cause I want to keep both paws on the wheel! I will tell him your suggestion. BearHUG & RosyPoodleKisses! This pic was early in the lesson while the car was in park. But you're right. That is the first thing I should do when I get in the car. I will tell Daddy he needs to brush up at instructor school! BearHUG & RosyPoodleKisses! 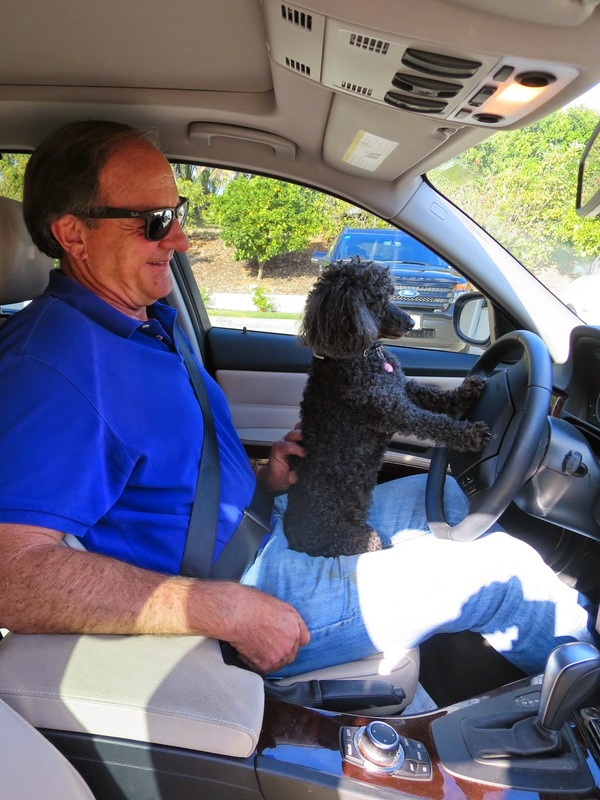 Rosy how cool your dad is giving you driving lessons! I bet you'll be a great driver, but it seems to me being a princess, you should have your own chauffeur! Yes, i am used to being chauffeured. (Mommy and Daddy refused to wear chaffer uniforms!) But I thought I should also be able to drive so I can be an independent Princess. BearHugs & RosyPoodleKisses!